Using instruments on NASA's 2001 Mars Odyssey spacecraft, surprised scientists have found enormous quantities of buried treasure lying just under the surface of Mars -- enough water ice to fill Lake Michigan twice over. And that may just be the tip of the iceberg. "This is really amazing. This is the best direct evidence we have of subsurface water ice on Mars. 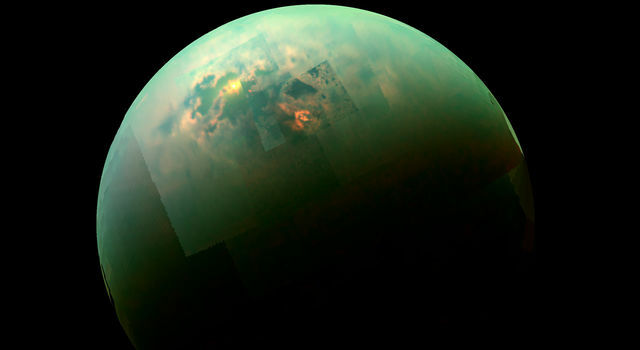 We were hopeful that we could find evidence of ice, but what we have found is much more ice than we ever expected," said Dr. William Boynton, principal investigator for Odyssey's gamma ray spectrometer suite at the University of Arizona, Tucson. Scientists used Odyssey's gamma ray spectrometer instrument suite to detect hydrogen, which indicated the presence of water ice in the upper meter (three feet) of soil in a large region surrounding the planet's south pole. "It may be better to characterize this layer as dirty ice rather than as dirt containing ice," added Boynton. The detection of hydrogen is based both on the intensity of gamma rays emitted by hydrogen, and by the intensity of neutrons that are affected by hydrogen. The spacecraft's high-energy neutron detector and the neutron spectrometer observed the neutron intensity. The amount of hydrogen detected indicates 20 to 50 percent ice by mass in the lower layer. Because rock has a greater density than ice, this amount is more than 50 percent water ice by volume. This means that if one heated a full bucket of this ice-rich polar soil it would result in more than half a bucket of water. The gamma ray spectrometer suite is unique in that it senses the composition below the surface to a depth as great as one meter. By combining the different type of data from the instrument, the team has concluded the hydrogen is not distributed uniformly over the upper meter but is much more concentrated in a lower layer beneath the top-most surface. The team also found that the hydrogen-rich regions are located in areas that are known to be very cold and where ice should be stable. This relationship between high hydrogen content with regions of predicted ice stability led the team to conclude that the hydrogen is, in fact, in the form of ice. The ice-rich layer is about 60 centimeters (two feet) beneath the surface at 60 degrees south latitude, and gets to within about 30 centimeters (one foot) of the surface at 75 degrees south latitude. "Mars has surprised us again. The early results from the gamma ray spectrometer team are better than we ever expected," said Dr. R. Stephen Saunders, Odyssey's project scientist at NASA's Jet Propulsion Laboratory, Pasadena, Calif. "In a few months, as we get into martian summer in the northern hemisphere, it will be exciting to see what lies beneath the cover of carbon dioxide dry-ice as it disappears." "The signature of buried hydrogen seen in the south polar area is also seen in the north, but not in the areas close to the pole. This is because the seasonal carbon dioxide (dry ice) frost covers the polar areas in winter. As northern spring approaches, the latest neutron data indicate that the frost is receding, revealing hydrogen-rich soil below," said Dr. William Feldman, principal investigator for the neutron spectrometer at Los Alamos National Laboratories, New Mexico. "We have suspected for some time that Mars once had large amounts of water near the surface. The big questions we are trying to answer are, 'where did all that water go?' and 'what are the implications for life?' Measuring and mapping the icy soils in the polar regions of Mars, as the Odyssey team has done, is an important piece of this puzzle, but we need to continue searching, perhaps much deeper underground, for what happened to the rest of the water we think Mars once had," said Dr. Jim Garvin, Mars Program Scientist, NASA Headquarters, Washington, D.C.
JPL manages the 2001 Mars Odyssey mission for NASA's Office of Space Science, Washington, D.C. Investigators at Arizona State University, Tempe; the University of Arizona, Tucson; and NASA's Johnson Space Center, Houston, operate the science instruments. The gamma-ray spectrometer was provided by the University of Arizona in collaboration with the Russian Aviation and Space Agency, which provided the high-energy neutron detector, and the Los Alamos National Laboratories which provided the neutron spectrometer. 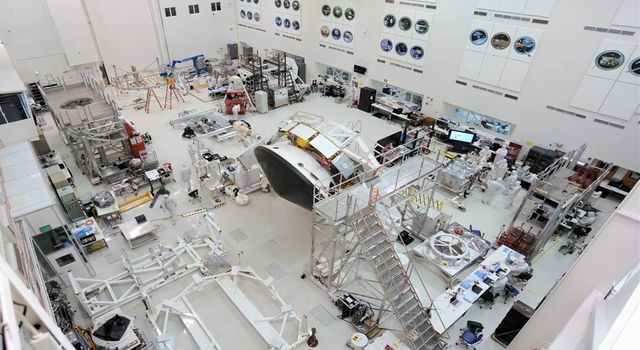 Lockheed Martin Astronautics, Denver, developed and built the orbiter. 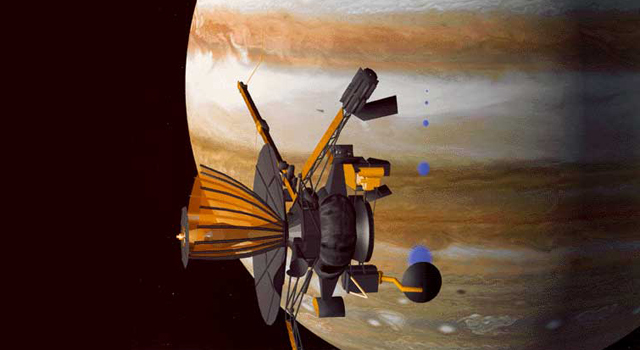 Mission operations are conducted jointly from Lockheed Martin and from JPL, a division of the California Institute of Technology in Pasadena. 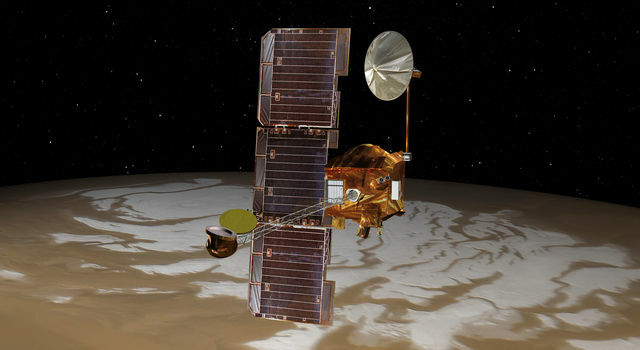 Additional information about the 2001 Mars Odyssey and the gamma-ray spectrometer is available on the Internet at: http://mars.jpl.nasa.gov/odyssey/ and http://grs.lpl.arizona.edu.